A surprisingly affordable high-end rig. It's not the prettiest prebuilt on the market, but that doesn't matter once you see it run. It’s quiet, compact and, given the list of components, cheaper than most other high-end rigs. There’s a growing trend for prebuilt, small form factor gaming desktop PCs with a hefty spec list. 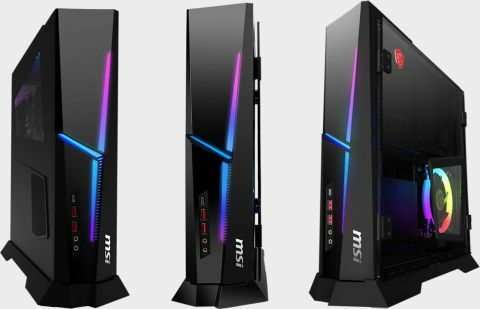 Small form factor cases have been around for a while, but the chassis of some of these new prebuilt PCs are nothing short of stunning, both on the outside and on the inside. Airflow becomes a higher priority with tightly spaced components, but the airflow on MSI’s Trident X isn’t the only good thing about it. Oh no. At five inches wide, the Trident X looks deceptively compact from the front, but just like a good pub sandwiched between old brick buildings, it extends three times as long, leaving enough room for a dual-fan RTX 2080 and everything else needed for a high-end gaming PC. The right side panel is swappable for either an opaque, matte black metal panel, or a dark frosted tempered glass panel. The RGB heatsink fan is visible through the mesh vent on the side regardless, but that’s the only pretty thing on that side of the case. The rest of the visible internals are cables, the PSU, and two vertically mounted SSD bays. Not exactly exciting. Which is why some might prefer to leave the opaque panel on, but it’s easier to access the SSD bays with a swinging, magnetic tempered glass panel. (Maybe wanting both pretty and practical is asking too much, but I don’t particularly like looking at the “backside” of a gaming PC.) The other panel doesn’t switch out, but there is also a mesh vent to show off the graphics card inside the case, which sits under the glow of RGB lighting, as well as a vent for the PSU fan. Let’s go back to the cooling solution for a second. The Trident X model we received comes with an air-cooled Intel Core i9-9900K. Normally, if we were to recommend building a high-end or extreme gaming PC, we’d say use a liquid cooled option. But, since this prebuilt comes stock with an air cooler, it’s important to make sure the CPU temps don’t get to high. So, how did the air cooling solution fair? The CPU on our model reaches clockspeeds of 4.8 GHz, but be wary about trying to push that number any further. Running multiple Cinebench tests back to back pushed temps as high as 76 C during the multicore tests. There’s a risk of throttling if the temperature gets over 85 C, but having spent an extensive amount of time with the Trident X, the worst I encountered was a warm chassis after a long play session with a GPU-heavy game. Performance-wise, there isn’t much left to the imagination given the juicy list of high-end components. The processor consistently spat out numbers between 2016 cb and 2024 cb in Cinebench, and the 3D Mark benchmarks showed crazy-good performance at 1080p and 1440p (23,709 and 12,459, respectively). 4K was a bit sluggish with a score of 6,494. Actual gaming in 1080p on ultra confirmed those 3D Mark scores: Shadow of the Tomb Raider performed at an average of 122 fps; Total War: Warhammer II at an average of 103 fps between battle, campaign and skaven modes; and Ghost Recon: Wildlands turned out an average of 74 fps. I also had the opportunity to see how Metro Exodus performed on the Trident X with ray tracing turned on. Our earlier analysis showed the fps hovering around 60 at 1080p on ultra with a RTX 2060, so it wasn’t surprising that the RTX 2080 in this configuration surpassed that number. The Trident X it’s not the prettiest small form factor PC out there, and some might balk at the air cooling solution and the minimal RGB lighting, but for those looking for something that will handle nearly any game flawlessly up to 1440p on ultra, the Trident X has many excellent features. It’s quiet, compact, and the price tag feels almost criminal considering what components inhabit its chassis. Another solid contender in the world of prebuilt, small form factor PCs.